NEMT has been concerned with the unregulated expansion of hill tracks since we started in 1979. We have witnessed time and again that what little regulation there is in place for the building or expanding of hill tracks is being ignored. 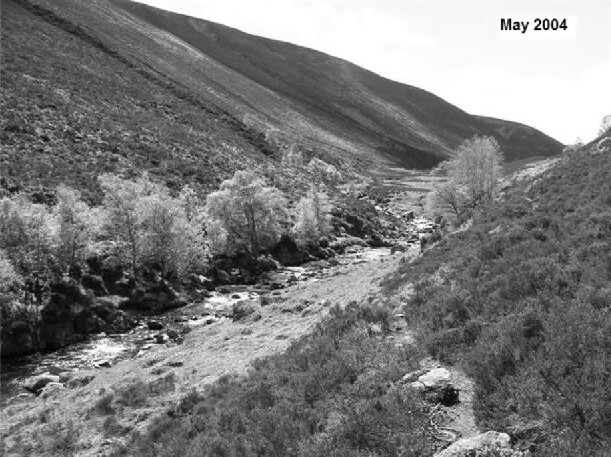 Whilst previous issues will tell you more about our Hilltracks Project that we started in 2007, this article updates on what is happening with regards to mapping out what hilltracks there are already in the north eastern quarter of the Cairngorms National Park. It then updates our progress with regards to digitising Dr Adam Watson's records of 50 years of hill tracks in the north east. We then take you through what is happening to the regulation, or lack of several specific hill tracks we have been following here in the north east. 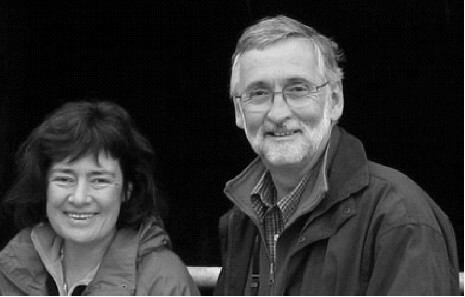 We cover Mountaineering Council of Scotland's work in this field that has led to the setting up a Scottish Parliament petition and conclude with a welcome late addition from Peter Peacock, MSP who raised this petition along with Sarah Boyak MSP. Since our Spring 2009 issue of Mountain Views we have continued to collect footpath data in the field and now have over a thousand photographs and we are well on our way to completing a full survey of all Hill Tracks in the North East corner of the Park. During 2010 we will be focussing on asking people to visit and survey the remaining un-surveyed tracks that we will identify for them. People have been, and are, busy so plans to extend our Project to cover the whole of the Park will have to take a back seat. So whilst we will be resurrecting the Project this summer the priorities on the north side of the Park are likely to be resisting plans to build huge numbers of houses within the Park and also proposals to open up the current closed system at the top of the funicular (see more later in this newsletter). In effect Hill Tracks are probably going to have to take a back seat for a while but they do remain an NEMT priority. This is going well. We were fortunate to gain agrant for 50% of the costs from Scottish Natural Heritage, although we were less lucky with the other 50% from the Park Authority. The digitising is now complete and we are working on the attributes to describe the tracks and verifying our understanding with Adam Watson. During the summer, we plan to publish the work on the NEMT web site. Retrospective planning conditions to carry out remedial work on both the Balmore to Auchtaven and the Gleann An-t Slugain Tracks tracks, as required by the Scottish Office Reporter, have not been complied with. We have compiled a detailed report on these "missing" works and are currently checking the detailed requirements with local experts to ensure that we push for the right remedial works to be undertaken by the estates. This checking exercise has been held up by the large amounts of snow that we've had this winter. Completing the work and engaging with Aberdeenshire Council will be ourtop priority this spring. Remedial works have now been carried out on the unconsented Water of Avens track that we reported in our Spring 2009 issue of Mountain Views. SEPA has also reviewed and approved this work. There is now a new track where there was none before but removal of the track will cause more environmental damage and leaving it there is deemed the best course of action. Enforcement via the SGRPID (Scottish Government Rural Payments and Inspections Directorate) cross compliance unit is being considered. If this goes ahead, it could result in a significant financial penalty. This is of course essential to stop other estates taking this "get the track built and worry about planning later" approach to the build of a new track this being an approach NEMT has witnessed and reported on in recent years. The local authority, Perth & Kinross Council, have requested the estate to apply for retrospective planning permission. We need to ensure that the process ends up with suitable remedial works not only imposed by the authorities but also implemented by the estate. As above, the estate will now have to submit two requests for retrospective planning permission. Again, our focus needs to be on the adequacy and full implementation of the remedial works. Our campaign on the new track up the Hill of Saughs came to nothing as Angus Council caved in and accepted that the new track was for agricultural purposes and hence did not need planning permission. The estate continues to generate stories in their efforts to boost grouse numbers. Last year, a poisoned eagle was discovered. This year, there are tales emerging of sheep being rounded up using people instead of dogs to reduce disturbance to the remaining grouse, truly bizarre. Their fame is spreading, people from well outside the area have heard of their "stop at nothing" efforts. Hopefully, this notoriety will filter through to some of the local officials who may be will be less ready to accept anything that comes their way. You will all have seen the online petition to generate publicity about the poor planning protection available to stop new Hill Track construction. NEMT has been involved in supplying ammunition and will be continuing going forward. The line above on the Millden estate shows how the existing law can be flouted. It as a tactic tried in the early days by the Invercauld estate, although here the Reporter was unconvinced. For those not on our email distribution list, the text of the MCofS campaign is set out below, as per the Scottish Mountaineer. One of the highest impact on wildness reported to MCofS are hill tracks. 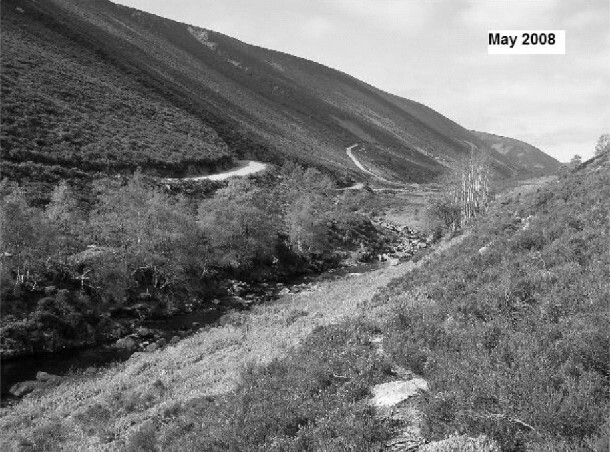 Ugly and environmentally damaging hill tracks are constructed every year with no requirement that they are considered through the planning system. Beautiful wild areas, appreciated by Scotland's residents and visitors, are being blighted by these uncontrolled eyesores. The national importance of this has finally come to the notice of the Scottish Parliament after discussions I had was raised by Peter Peacock MSP through Parliamentary Questions in response to the my highlighting the incremental reduction in wild areas. Government figures show that between 2002 and 2005, the area of Scotland unaffected by views of man-made developments fell from 42% to 32%. I regularly receive photographs of outstandingly badly constructed tracks through previously wild areas, even in supposedly protected areas. The sad thing is that these are irreversible and completely uncontrolled through the planning system. The longer the review of Permitted Development Rights (PDR) is delayed the more of wild Scotland will be lost forever. PDR are regulations that are quite complicated, but basically permit landowners, without any permission or control, to construct tracks for forestry or agricultural reasons. Many of these tracks are in upland areas where there are only a few sheep or where an unviable plantation exists. The Planning etc. (Scotland) Act 2006 is supposed to modernise the planning system for the benefit of the people and environment of Scotland, but the implementation timetable is being permitted to slip repeatedly. There has already been more than a 3 year delay since a report by Heriot-Watt University, commissioned by the Scottish Executive, clearly recommended an extensive overhaul of the uncontrolled rights of landowners to construct hill tracks through our beautiful wild areas. The Scottish Government has taken no action on this. Unless there is considerable pressure put on the Scottish Government, the planned tightening of the system of controls will slip so far into the future that it has no prospect of being considered in this Scottish Parliament. www.scottish.parliament.uk/msp/membersPages/MSPAddressPostcodeFinder.htm and save our wild country from disappearing! If anybody hasn't signed the petition, we encourage you to please do so now. The above news of the Petition was breaking just as this issue of Mountain Views was getting finalised for our Banchory printers. We therefore contacted Peter Peacock MSP's office and we are now very pleased to include the following article by Peter Peacock MSP himself. Who knows, we may even manage to get Mr Peacock to take part in our Winter Lecture season for 2010/2011. As North East Mountain Trust readers will know, concern over the unregulated construction of hill tracks in the uplands of Scotland has been mounting. I was approached by a number of constituents and the Mountaineering Council of Scotland who voiced their concern about the sudden appearance of unregulated hill tracks and the damage that they were doing to the Mountains of Scotland. As a result, my colleague and Labour Environment Spokesperson, Sarah Boyack MSP and I launched the online petition on the 25 February of this year which has already gathered cross party support. Today, after only one month, we are pleased to have over 1500 signatures. The campaign has not stopped and we will work to continue gathering support to try and ensure that our outstanding landscapes of Scotland are respected and protected. The campaign has been in the making for far longer than this last month. I first got involved when a constituent wrote to me concerning a road cut into the north face of Beinn Bhuraich above Loch Mor in the Monadhliath Mountains. After talking to Hebe Carus, the access and conservation officer for MCofS, we realised just how widespread this problem is. Since these roads are not just eye-sores but a major cause of erosion, action must be taken to protect our wilderness areas for future generations. The damage created by these roads are long lasting and not easily reversed. Potential harm to fauna and flora within our uplands poses a disastrous risk to our natural heritage. Hill tracks are supposed to serve as necessary access to land for agricultural purposes and for maintenance and management of such. Understandably, farmers and crofters on lower ground have legitimate need for tracks and there are planning restrictions surrounding tracks within protected areas. However, outwith these areas no regulation exist for the control and development of hill tracks. This means that hill tracks that cut unnecessarily into the uplands of Scotland will not be subject to regulation or control, if it is claimed they are for agricultural use. There are strong suspicions that tracks that have been appearing are much less to do with agriculture, than to do with getting sporting clients up and down the hill faster, and drier and in greater comfort. That would be no reason for long term damage to our mountains. The Scottish Government is committed to reviewing the General Permitted Development (Scotland) Order 1992 and this presents an opportunity to close this loophole. Work commissioned by the last administration sought to set the scene for a review of powers and controls and to modernise planning guidelines. There is a need, and now an opportunity, to get control of the situation and, if nothing else, establish criteria that must be satisfied for agricultural status. At the moment, simply claiming the road to be for agricultural purposes essentially gives the land owner free rein to bulldoze away. My belief is that planning consent ought to be required for such tracks on higher ground, in order to subject them to proper scrutiny and to be, potentially, refused in the wider public interest. The launch of the Hill Tracks Campaign has proved how important this issue is to people across Scotland and beyond. The support received continues to grow and I wish to thank all those who have supported us and invite you to continue to spread the word. I am pleased too that a date for a parliamentary debate has now been secured for June 9, 2010. Such a 'Members' debate requires the relevant Minister to attend and reply to what is said and this not only highlights to Ministers that enough MSPs, on a cross party basis, believe this is an issue needing attention, it also means the Minister needs to set out the current thinking of the Scottish Government on the issue. It is hoped that through the debate we will encourage the Government to give the matter greater urgency in finding a solution. However, we still need continued support through the campaign. I am looking forward to the campaign reaching its 2000th signature. This success of this campaign rests on those who sign the petition and spread the word to their friends, families and organisations. I encourage all of you who have signed the petition to keep up to date with the news and to watch the parliamentary debate online.